Featured snippets, what are they? And why are they relevant to your business? Well when a potential customer searches for something on Google, there are three different types of result they might see. They’ll see the paid listings at the top and possibly at the bottom of the page and the ‘organic’ results, which make up most of the page. But, the third are known as ‘snippets’ – sometimes called rich snippets or featured snippets. These snippets are important because firstly they are an organic result, meaning you’re not paying to have them appear, and secondly, they stand out a lot more than your regular results. As you can see below, the snippet takes up more space than two individual listings, paid or organic, and can also feature a thumbnail of the page in question. In SEO circles, these snippets have been named ‘position zero’, because they appear above what used to be the top organic ranking. It’s not hard to see why having your link appear there would be so valuable – readers get a preview of your content and are more likely to click through. Some tests have seen a 500% increase in traffic following their inclusion in a featured snippet. Now, much like the organic rankings, there is no way to guarantee you appear in a snippet, it all depends on how Google’s algorithm decides to respond to the particular search. What you can do is ensure that you have valuable content on your site that gives a comprehensive, authoritative answer to a particular question your potential customers might be asking. For example, if you run a plumbing firm, someone might ask “why is my boiler making a banging sound” – if you have some content that answers that question clearly, it may appear in a featured snippet. You’ll still need to compete for these results, in the same way you would normally for SEO, it means good content, a fast and easy-to-navigate website and lots of backlinks from other sites. 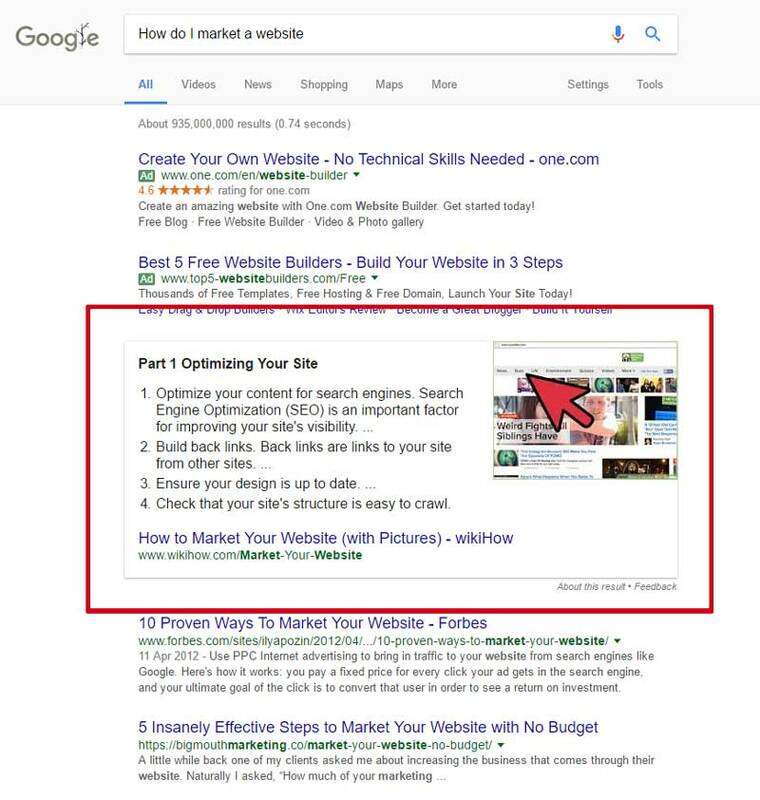 You can read more about how to go about creating featured snippet content in this blog post.